The function of the inner ear is to convert sound and spatial orientation into nerve impulses to be interpreted by the brain. As a result, dysfunction in the inner ear can result in both hyperacusis and vertigo. This article will focus on dysfunction leading to sound-induced pain and loudness discomfort with less attention on symptoms of vertigo. These vibrations are sensed and converted into nerve impulses by hair cells of the organ of corti. Below shows inner hair cells and outer hair cells attached to the basilar membrane. It is the inner hair cells that transmit the vibrations into nerve impulses while the outer hair cells help amplify or dampen vibration. 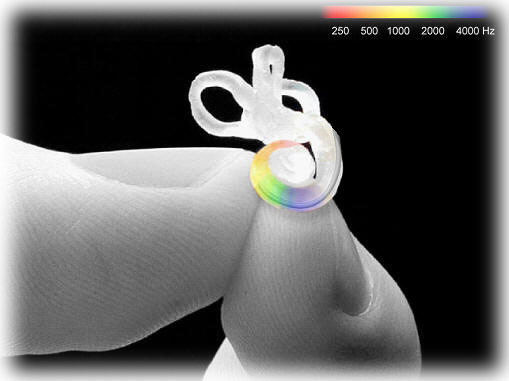 The video here provides an excellent overview of the cochlea. The cochlea does not contain traditional pain receptors so historically researchers have looked to the brain and middle ear to explain sound-induced pain. Recently, however, studies from Northwestern University and Johns Hopkins have shown pain receptor like behavior from the type II nerves that are connected to the Outer Hair Cells (OHCs). OHCs are the most susceptible to sound-induced damage. Although this is an exciting direction in hyperacusis research, more research is required to prove these nerves are pain receptors that contribute to hyperacusis. The suspected pain receptors (nociceptors) are the type II afferent nerves that travel from the OHCs to the brain (in red in the figure above) whose function is currently unknown. These nerves are different from the nerves that travel from the inner hair cells (IHCs) in a few ways. First, a single type II fiber generally connects to an estimated 7 OHCs while 10 type I fibers connect to just a single IHC. 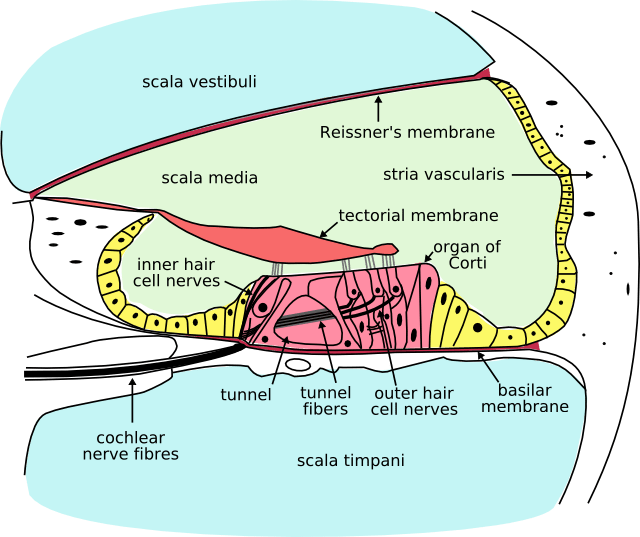 In fact only 5% of the nerves connecting to the brain from the cochlea are type II nerves while the remaining 95% are type I nerves from IHCs. Second, these type II nerves have a small diameter and are unmyelinated which makes them poorly suited for rapid transmission of sound information. These nerves more closely resemble nociceptors responsible for slow, aching pain. Third, while nerves from IHCs collectively respond to the full dynamic range of audible sounds levels, type II nerves will not be activated unless the entire pool of OHCs they are connected to are maximally stimulated by only the most intense sound levels. What possible use could these nerves have? Researchers from Johns Hopkins have been examining these nerves over the last several years. Below are several critical observations made in these studies. It requires almost complete excitation of OHCs for the afferent type II neurons to be activated. These neurons can be activated by extracellular ATP, a chemical that can produce pain when released by damaged cells including OHCs. Mechanical rupture or removal of OHCs causes a robust activation of these neurons. Note that OHCs are much more likely than IHCs to be similarly damaged from sound. With this information in mind, researchers from Northwestern University performed an experiment to try to activate these neurons through sound. This study confirmed that there is a unique path that is only activated during damaging noise levels (120 dB) but not “innocuous” levels (80dB and below). Granule cells of the cochlear nucleus were found to be the region activated by this signal. It is interesting to note that this is where other sensory information from the head and upper body (spinal trigeminal nucleus and dorsal column) are routed to assist with auditory processing. A signal routed the opposite direction would provide a path from auditory system to pain channels. There were two groups of mice used to test this theory. One group was a control and the other was genetically unique in that their IHCs were unable to transport the glutamate neurotransmitter and were therefore deaf. The deaf mice and the control mice were found to generate and send the suspected pain signal to the brain even though the deaf mice could not signal sound. Symptoms worsened by activity, coughing, or sneezing. It has been proposed that changes in fluid flow can result in conductive hyperacusis. Conductive hyperacusis occurs when the fluid in the cochlea moves more easily than it normally would. This will reduce vibration levels required for hair cell activation, change the resonance of the cochlea, and has potential to confuse the central auditory system. Diplacusis might be expected in those with conductive hyperacusis worse in one ear. Conductive hyperacusis can be a symptom of superior semicircular canal dehiscence. Another suspected cause for conductive hyperacusis is a change in compliance of the round window. See Treatment: Surgery for more information. Permanent hearing loss is not a requisite condition for hyperacusis as 40% of those with hyperacusis show normal hearing tests. As described in Potential Mechanisms: Central Auditory System, cochlear damage is a powerful trigger for hyperactivity and gain increases in the central auditory system. Some believe that a normal hearing test implies that the cochlea has not been damaged. This is not necessarily true. First, common hearing tests only test to 8kHz as these frequencies are the most useful for common activities and speech and are less subject to variation from person to person. However the frequencies from 8 kHz to 20 kHz are the most susceptible to damage and it is common for people even in their 20s to show hearing loss in these regions. Second, it has been shown that hearing tests can still be normal even with the loss of 80% of inner hair cells (IHCs) as long as outer hair cells (OHCs) are still intact. Third, each IHC is connected to roughly 10 nerve fibers that react to different loudness levels. Loss of these fibers would not show up on a hearing test as long as lower loudness level fibers remained intact. Thus cochlear output will have decreased while hearing tests would look normal. All three of these examples of hidden hearing loss are thought to have potential to initiate hyperacusis. Each inner hair cell is innervated by roughly 10 nerve fibers that are sensitive to different loudness levels. These nerves can be divided into 3 types: low threshold (Range 0-30dB), medium threshold (Range 15-45dB), and high threshold (Range 35dB and above). Figure modified from Tinnitus with a Normal Audiogram, Schaette R, McAlpine D.
Several animal studies have shown that temporary hearing loss can result in rapid loss of synapses and slow death of these nerve fibers. Studies also suggest that higher loudness level nerves are more susceptible to damage than the lower loudness level nerves. This damage is thought to be caused by excitotoxicity from excessive stimulation of the glutamate neurotransmitter. Hearing sensitivity can recover to normal levels while damage to higher loudness level nerves may remain. Thus cochlear output will have decreased while hearing tests would look normal. As research has shown reduction in cochlear output can result in gradual overcompensation of gain within the brain, this has potential to explain hyperacusis in those without hearing loss. The diagram below shows the example of enhanced gain compensation resulting from loss of nerve fibers. It is worth mentioning that damage to IHCs and IHC nerve fibers are suspected to cause problems with processing speech in noise. However, a survey of 85 hyperacusis patients (Anari 1999) found that speech in noise measures of the group were on average similar to the non-hyperacusis population. Due to the small sample size of the Anari study, a repeat of this test on a larger sample of hyperacusis patients would be valuable. Inner hair cells (IHCs) are directly responsible for converting sound into nerve impulses. 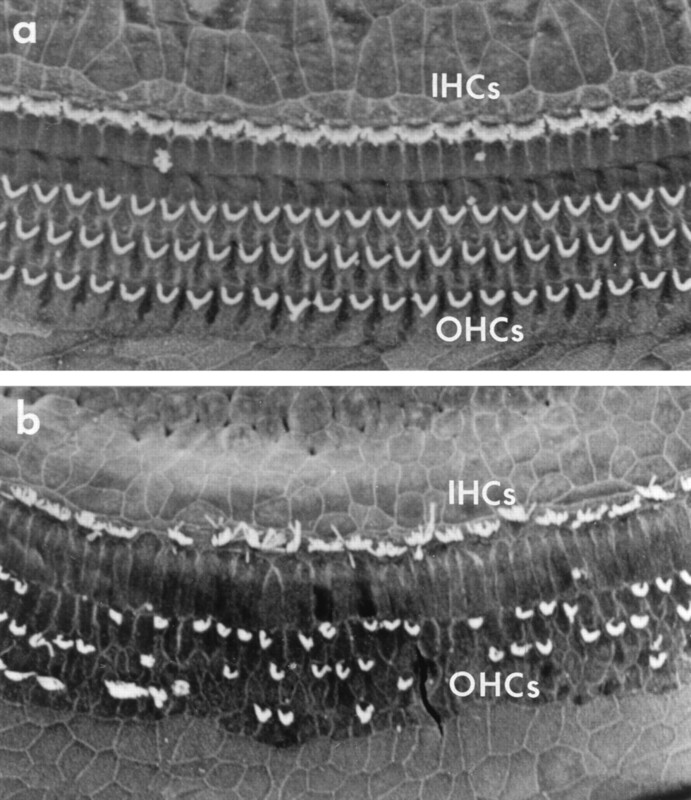 Outer hair cells (OHCs) don’t transmit sound to the brain but are critical for mechanically adjusting vibration in the cochlea to amplify quiet sounds and dampen loud sounds. Loss of OHCs reduces vibration and causes hearing loss. OHCs are the most susceptible to damage and the most common cause of noise induced hearing loss. Below is an image of healthy vs damaged outer hair cells. Although hyperacusis can occur without hearing loss, it is still suspected that permanent hearing loss can trigger hyperacusis. 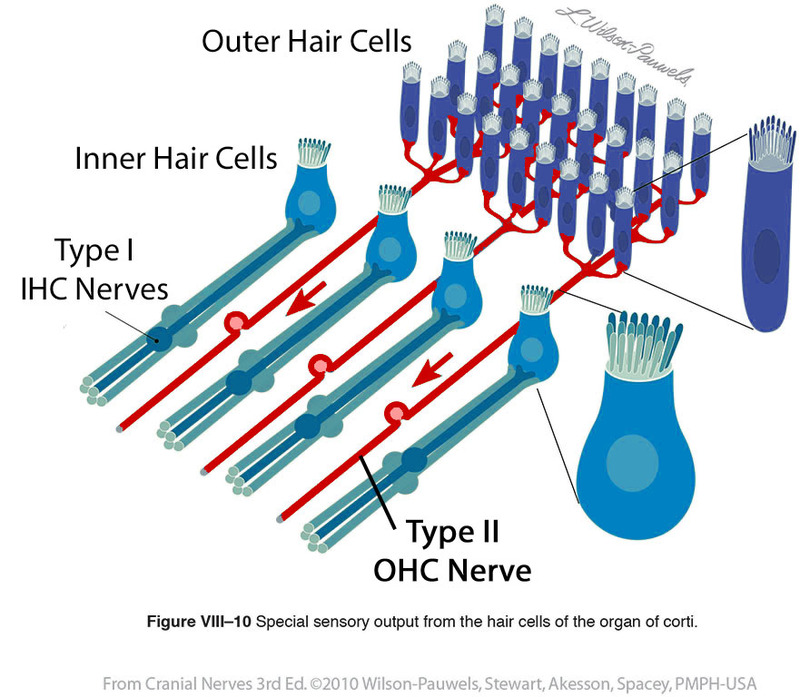 This mechanical feedback comes from the OHCs whose hairs (stereocilia) connect to the tectorial membrane and can extend and contract depending on the state of the OHC internal voltage level. The brain can tune these OHCs (via the efferent path) to enhance selectivity and to protect from louder sounds. It is important to note that the efferent control from the brain is not necessary for this amplifier to function. The cochlea itself is tuned in such a way that it naturally provides amplification as long as OHCs are functional. Some have suggested that a malfunction of OHCs or the efferent path could lead to hyperacusis either from an over-amplification of sounds or an under-protection of sounds. Some researchers find this unlikely for two reasons. First, hyperacusis patients often show normal otoacoustic emissions tests (Jastreboff 2014). Otoacoustic emissions tests measure functionality of OHCs. Second, a study of patients who had surgery to sever their vestibular nerve did not worsen or improve loudness tolerances after the operation (Baguely 2002,2003). The vestibular nerve carries the efferent nerves that control OHCs. Baguley DM. Hyperacusis. J R Soc Med 2003:96:582-585. Baguley DM, Axon PR, Winter IM, Moffat DA. The effect of vestibular nerve section upon tinnitus. Clin Otolaryngol 2002:27:219-26. Bharadwaj H, Verhulst S, Shaheen L, Liberman MC, Shinn-Cunningham B. Cochlear Neuropathy and the coding of supra-threshold sound. Frontiers in Systems Neuroscience 2014:8(26):1-18. 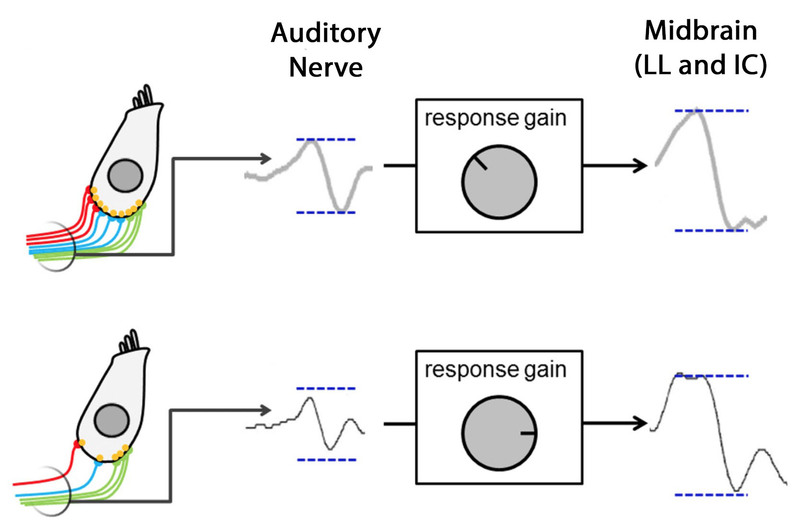 Chang L, Glowatzki E, Fuchs P. Purinergic Modulation of Type II Cochlear Afferents: Sensing Trauma in the Ear? ARO Midwinter Meeting Abstract 2014:37:419-420. Flores E, Duggan A, Madathany T, Hogan A, Marquez F, Kumar G, Seal R, Edwards R, Liberman MC, Garcia-Anoveros J. A Non-cononical Pathway from Cochlea to Brain Signals Tissue-Damaging Noise. Current Biology 2015:25:1-7. Guinan J, New Insights into Cochlear Amplification. Biophysical Journal 2013:105:839-840. Jastreboff P, Jastreboff M. Treatments for Decreased Sound Tolerance (Hyperacusis and Misphonia). Seminars in Hearing 2014:35:105-120. Knipper M, Dijk P, Nunes I, Ruttiger L, Zimmermann U. Advances in the neurobiology of hearing disorders: Recent developments regarding the basis of tinnitus and hyperacusis. Progress in Neurobiology 2013:111:17-33. Schaette R, McAlpine D. Tinnitus with a Normal Audiogram: Physiological Evidence for Hidden Hearing Loss and Computational Model. The Journal of Neuroscience 2011:31(38):13452-13457. Weisz C, Lehar M, Hiel H, Glowatzki E, Fuchs P. Synaptic Transfer from Outer Hair Cells to Type II Afferent Fibers in the Rat Cochlea. The Journal of Neuroscience 2012:32(28):9528-9536.